GRAND JUNCTION, CO USA ― February 2018 ― GPD Global - a manufacturer of precision fluid dispensing systems for high-volume 24/7, low-volume/high-mix, and R&D production - will exhibit in Booth 3325 at the upcoming IPC APEX EXPO 2018 scheduled to take place February 27-March 1, San Diego Convention Center. 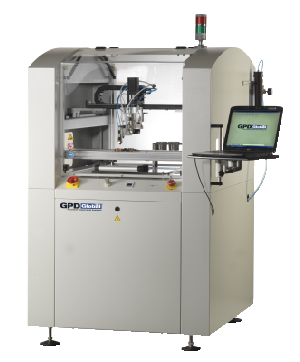 GPD Global will officially launch its new, full-featured benchtop dispense robot, Catalina, and a cost effective, conformal coating system with tilt-and-rotate. NEW - See Catalina, the full-featured benchtop dispense robot in action: semi-automated benchtop dispense robot equipped with automatic vision, laser surface sensing, and automatic nozzle alignment and calibration. NEW - See SimpleCoat, our low cost, inline, simple Conformal Coating System has been enhanced with tilt-and-rotate capability. Combined with two dispense pumps and full-featured programming, this Conformal Coating machine is a well-rounded performer. High Precision Dispensing System (MAX Series) live demonstration of lead free type 6 Solder Paste for 01005 and various patterns will be on display. The MAX Series dispensing system is capable of a wide variety of dispense applications including Solder Paste, Conductive Adhesive, Underfill, Thermal Interface Material, etc. GPD Global will also exhibit a full range of Latest Dispense Technologies with controllers for integration or retrofit. Dispense Technologies on display include the versatile Precision Auger Pump, the high speed NCM5000 Jetting Pump, and the Volumetric Pump (PCD) Series. Axial Lead Forming System (CF-8) meets exacting military standards for axial taped or bulk components while eliminating component body stress. The CF8 delivers consistent results for components being formed either vertically or horizontally. Radial Lead Forming System (CF-9) forms and cuts 2- and 3-leaded taped components, capacitors, transistors, and LEDs. This system is designed to precisely and repeatedly form either standard or special formed lead configurations with consistent ease. 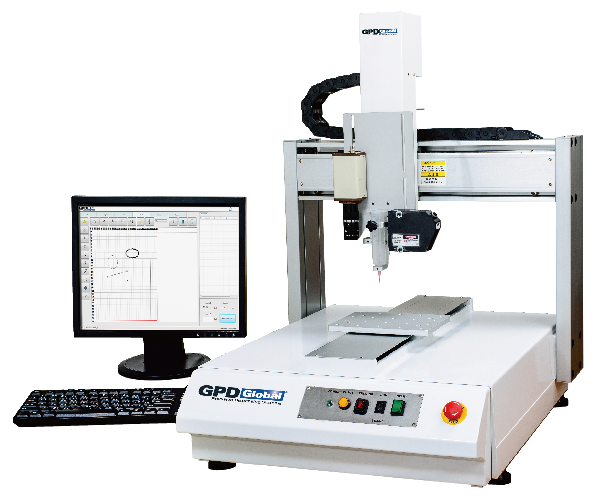 Radial Lead Forming System for Loose/Bulk (CF-10) forms and cuts 2, 3, 4, 5 and 7-leaded loose/bulk components such as TO-220s (live demo at booth 3325), capacitors with uniform body shape, and more. The Peel Back Force Tester (PBFT) is used to measure the peel back force of carrier tape. The Peel Back Force Tester supplies carrier tape pull back force data to ensure only "in spec" component reels are supplied to pick & place systems. See live demo! Stop by Booth 3325. Experts are there to discuss your production needs. Whether your project requires a pump for retrofitting, a fully automated dispense system, coating, or component preparation, we have a solution for you.